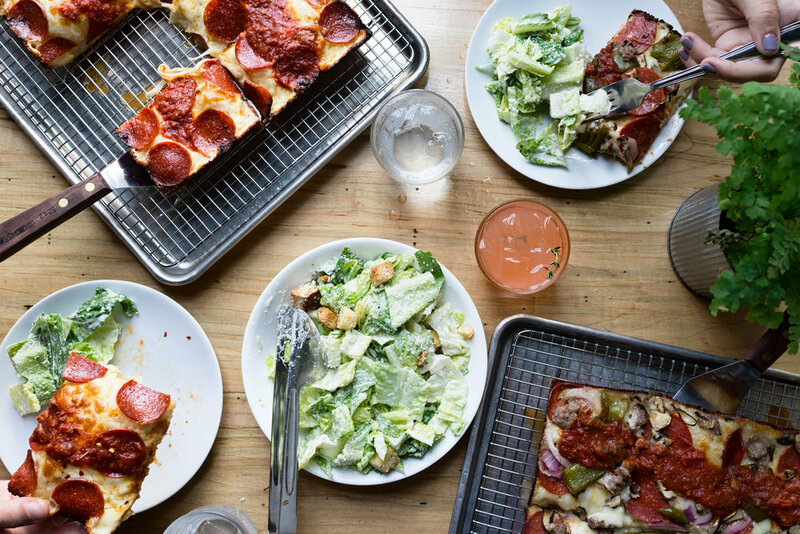 Sister restaurant to Union Pizzeria & Union Squared Chicago, Union Squared Evanston features Detroit-style pan pizzas in this new, charming little Evanston hot spot. If you’re not familiar with Detroit-style pies you don’t know what you’ve been missing! It’s a regional Michigan favorite baked in a custom black square (technically a rectangular) metal pan that is made in Detroit, of course. It has a light and fluffy focaccia-style crust with a buttery bottom and crispy edges that is then topped off with the creamiest Wisconsin Brick cheese and finally finished with the most delicious tomato sauce you’ll ever eat. Our new spot offers 15 indoor seats, plus a generous 30 seat beer garden just behind the restaurant. The menu includes 11 staple pies & rotating special that can be ordered whole, or choose from four classics in individual 1/4 pie size, three salads, plus Local Temperance & Sketchbook beer, wine & a rotating cocktail of the week. Open weather permitting! No rain & 65 degrees or higher. Check our Instagram, Twitter & Facebook page for updates! Please contact heather@unionpizza.com if our beer garden is the right fit for your event!